The digital magazine Places.Travel encountered a scale problem early on. As publishers of Places.Travel, the fast-growing digital magazine for Millennial and Gen Z travelers, we bumped into the problem of scale in late 2017. Our continual desire is to put the best, most compelling and most relevant travel content in the hands of readers. But with tremendous traffic growth, we started to lose our one-to-one relationship with readers. We had to face some daunting questions. How can we get closer to our readers? How can we serve their specific, individual interests? How can we accomplish these things before we lose reader attention? We only have seconds to grab and retain reader’s. Their time and attention is precious. According to a recent study by Flurry, Americans spend roughly 5 hours on their smartphones every day. Further, around 65% of this time is spent in communication tools like SMS, email and chat apps. Facebook clearly recognized the growing trend and predicted the possibility that Messenger usage would exceed Facebook itself. A few years ago, it made the move to split Messenger off its core platform. In the last few months, messaging platforms have begun to open their API to built bots, apps and intelligence into their core ecosystem. Recognizing this usage and opportunity, brands have begun to move away from custom mobile apps to instead favore already adapted platforms, including Messenger, Whatsapp and more. With Facebook as our fastest growing and most engaged audience, our questions led us to Messenger. Our solution? An AI-powered real-time Facebook Chatbot. The next step was to implement the solution. We began by analyzing web analytics to understand user behavior flow on our website. Next, we designed patterns around these flows that enabled us to understand interests and top content / questions. This exercise made it possible to build “decision trees” that would aid in the design of conversation flow. Places.Travel is built for Gen Z and Millennial readers who want to “experience the authentic” and “travel like a local”. We’ve created a distinct brand voice and tone on the platform and we knew we needed to match it through our Chatbot. To accomplish this, we created Maria and we introduced her as our AI-powered Chat Concierge. We felt it was important to immediately let visitors know that they were interacting with automated technology while also giving it a personality. Send a custom payload into a natural language parser allowing the bot to understand more complex questions and statements. Build a “people” database and store parsed interests as user attributes, thereby understanding individual needs and wants better. Return an answer, in order of relevance within 1–2 seconds to Messenger. Today, Maria actively serves our audience of almost 4,000 Facebook fans. Developed for just over 3 months, we consider Maria to be a teenager — in her adolescence. She’s smart but she hasn’t learned everything she can. Interactions with users help her AI to improve and our developers analyze her interactions for improvement opportunities. The video below demonstrates interaction with the Places.Travel chatbot. For a personal chat, head over to Places.Travel and click the Messenger icon in the lower right corner (you’ll need a Facebook account). Want to explore how you can build a Chatbot to better share your story? Reach out to Odyssey! 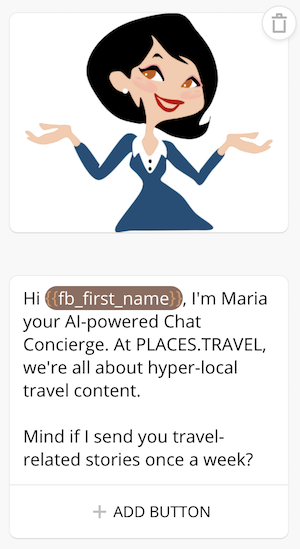 Building a Chatbot Concierge to serve Millennial Travelers was originally published in makestorieshuman on Medium, where people are continuing the conversation by highlighting and responding to this story. Previous Post (p)	Who Tells The Better Story? Next Post (n)	Reaching your audience isn’t enough. You have to speak with their voice.